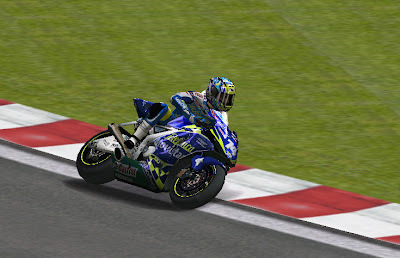 This is the 4th helmet model I made, this one I made the texture for a rider I respect allot Daijiro Katoh. I self have a Norick Abe Replica Shoei X- Eleven so I could easily make this helmet model. I just had to make photo's of the helmet from each side and use it as a base. This is a progress shot of the helmet. I learned myself spline modeling and also think it is the best way to model. I also copy the model that I am working on and link it with the other and the copy I added surface so I could look how the model look like while in the other screen I work one the splines. 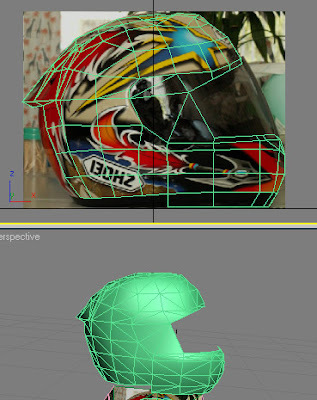 Here is an in game shot with the helmet texture in progress.